Folks who own larger SUVs and vans know that in a pinch you can usually fold the seats flat into a bed-like platform, creating a sleeping area in a pinch. For a quick overnight trip, perhaps when it's a little too cold to be comfortable in a tent, it works. But folks who own smaller crossovers or sedans are out of luck. Sleeping on a reclined front seat is, let's be honest, not usually a great solution. So that's why, for some people, a solution like this telescoping Hitch Hotel might work. Considering it hangs off your tow hitch, your first question will probably be, how much does this sucker weigh? After all, a Class II hitch is only good for a tongue weight of about 350 pounds. 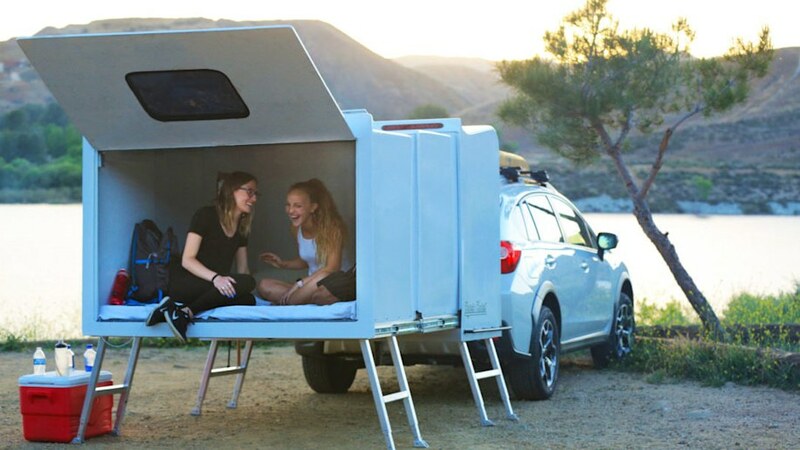 Well, the Hitch Hotel weighs 230 pounds unloaded, and can top out around 380 pounds with additional gear stored inside, so the maker recommends a Class III hitch with a tongue rating of at least 600 pounds. We agree — if your car or crossover can't handle a Class III hitch, this probably isn't a good solution for you. Very small trailers with lower tongue weight might be a better bet. The advantage of this over a very light trailer is overall length. In its closed position, it's short, and sits about 6 inches from the rear bumper. It expands to a total of 135 cubic feet of space, and is about 7 feet long when fully extended. At the narrowest point, it's 58 inches wide. If you slept with your head at the wider end, it should be fine. There won't be room for anything else inside, but it should be a quiet and cozier place to sleep than your average tent. It rests on ladder-like legs when expanded. It appears there's a provision for leveling the unit, but it's unclear how it works. The narrow feet of the supports might be an issue on softer ground. When it's not in use, it can be detached and placed on some sort of wheeled cart that comes standard with the unit, but it's not clear exactly how hard it'll be to take the Hitch Hotel on and off the vehicle. Off the vehicle, it'll take up 16 square feet of space in your garage or storage area. Want one? Like many innovative ideas, this one is a Kickstarter, so "buy" with caution. Actually, make that pre-order, since they haven't been built yet.